The catch cry of Queensland is "Beautiful one day, perfect the next". For lovers of golf what could be better than that? Warm, sunny days, mild nights and very little rain during the day makes for perfect golfing conditions. Motorised carts and exceptional service levels complete the experience. The Gold Coast is one of the most popular golfing destinations in Australia - especially during the winter months down in the southern states ! This great 7 day golfing package includes accommodation, and golf at five fabulous resort style courses. Arundel Hills Country Club features manicured fairways that meander between groves of majestic eucalypts, tracing the natural features of a gently undulating landscape. Abundantly flowering native shrubs and trees are mirrored in the many ponds and lakes that dot the course. Off the course, dominating the green panorama of Arundel Hills is the imposing colonial style clubhouse. The course layout is exceptional and is designed to challenge the best or to be played as hard or relaxed as individual players choose. Arundel Hills Country Club features manicured fairways that meander between groves of majestic eucalypts, tracing the natural features of a gently undulating landscape. Abundantly flowering native shrubs and trees are mirrored in the many ponds and lakes that dot the course. The course layout is exceptional and is designed to challenge the best or to be played as hard or relaxed as individual players choose. Off the course, dominating the green panorama of Arundel Hills is the imposing colonial style clubhouse. 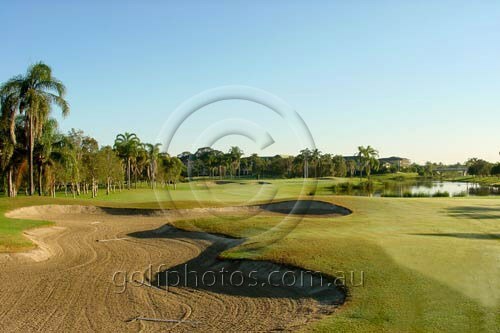 Burleigh Golf Club is set amid the picturesque district of Miami on the beautiful Gold Coast. As a traditional golf club, Burleigh offers the club golfer a challenging and diverse golfing experience. The course is a par-71, 18 hole layout combining tree-lined meandering fairways and naturally landscaped greens. 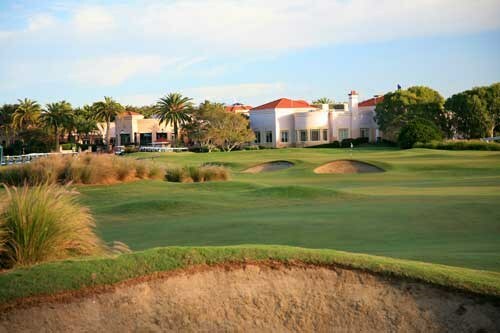 The course is playable in superb condition year round thanks to the recycled water supply and use of state-of-the-art course machinery and turf management techniques. 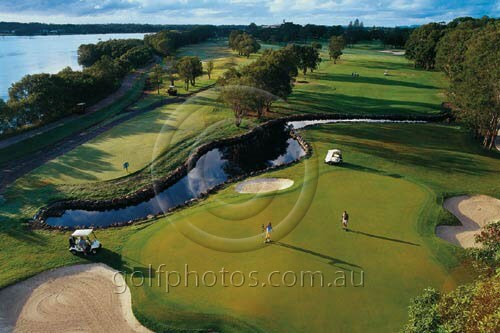 Coolangatta Tweed Heads Golf Club, plays host to two Championship golf courses; both the River and West course are good golfing challenges, with the River Course being "Voted in the Top 25 Public Courses in Australia" by Golf Australia Magazine. The River course is the more challenging of the two. It doesn't play as long but is more a placement course. It is heavily treed, with water coming into play on about 6 holes. 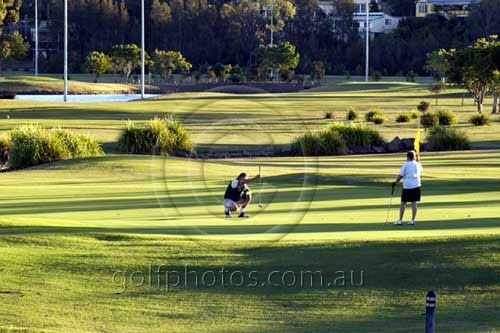 Located in Tweed Heads on the NSW side of the border and about 5km from Coolangatta - its neighbouring Queensland town, Coolangatta & Tweed Heads Golf Club is the perfect Golfers holiday destination. Situated on the edge of the beautiful Tweed River and on a 101 hectare dedicated wild life reserve, Coolangatta & Tweed Heads Golf Club offers a truly magnificent golfing experience. 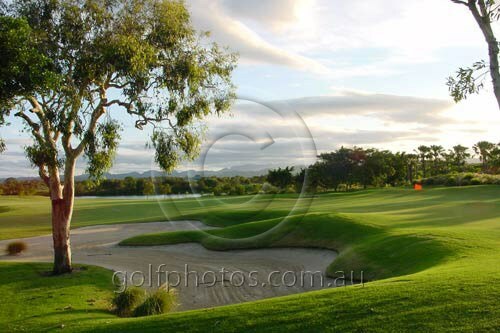 Coolangatta & Tweed Heads Golf Club plays host to two Championship golf courses; both the River and West course are good golfing challenges, with the River Course being "Voted in the Top 25 Public Courses in Australia" by Golf Australia Magazine. Relax and enjoy the facilities our spectacular Clubhouse has to offer. 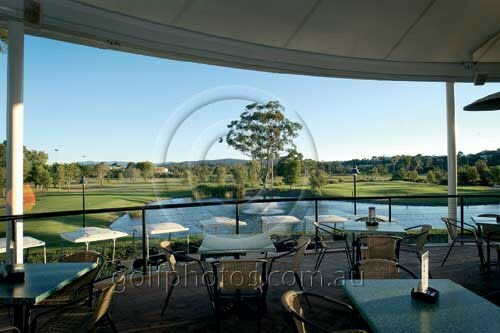 With Clubhouse views overlooking the finishing holes and the Tweed River, experience the delight that only Coolangatta & Tweed Heads Golf Club can provide. Dog leg right par 5 which is reachable in two for the long hitter provided the drive is shaped left to right. Water crosses the fairway 50m in front of this green and winds its way around to the right, so caution is required when laying up on this hole or when shooting at the green for 2. A short hole which requires a long iron down the right hand side of the fairway to avoid a well positioned fairway bunker. second shot is then a short iron to a heavily contoured green which is very hard to hold. Short hole which requires a short iron to a generous green. Hole rated number 2 and requires a drive left of centre to avoid fairway bunkers. Mid to ling iron then required to a slightly raised green. Short hole with out of bounds down the left and plenty of fairway bunkers to catch stray tee shots. Long iron or fairway wood is best choice from a tee followed by a wedge or short iron. Water and out of bounds guards the left hand side of the hole requiring accuracy all the way down. Blind second shot needs to be kept to the right side of the fairway which is the best angle to approach this green for your third shot. Long Par 3 made even longer as hole is open to any wind. Large, relatively flat green makes it a little easier. Strong dog leg right hole which often plays back into the prevailing wind. Long hitters can cut some of the corner off here but most players will aim a little left of the fairway bunker setting you up for a mid iron second shot to a flat long green. Once again a hole that can play very long back into the prevailing wind. Tee shot needs to be aimed towards bunkers down the right side of fairway with a little draw to follow the slight dog left to the left. Second shot is played into a green which is very long from back to front. Short hole to a new green which is both very large and very undulating so club selection is critical. Slight dog leg left hole which requires an accurate long iron or fairway wood from a tee followed by a short iron to a long undulating green. Long iron or fairway wood required here to reach the corner of this sharp dog leg to the left, leaving a short iron to a green which can be hard to hold. Narrow gun barrel tee shot which requires an actuated long iron or fairway wood to the fairway followed by a short second short to a two tiered undulating green. Tip, don't miss the green to the left. Dog leg left par 5 which is reachable in two for the long hitter particularly if the drive is hit with a draw or over the trees on the left corner. Safe to play the hole is out to the right of the tee, a good solid second shot followed by pitch to the most difficult green on the course. Rated the hardest hole on the course which requires a tee shot avoiding bunkers left and right then a long iron into a green which has a big swale on the right hand side. Another tough finishing hole which requires a straight drive avoiding bunkers right and trees left. Second shot is to a kidney shaped green which slopes from front to back making it very hard to hold. Probably the hardest par 3 on this course which usually requires a mid to long iron to a small green with lots of contours. Straight shot required here followed by a second shot avoiding bunkers down the left then a deft approach into a huge undulating green, which will produce many a three putt. 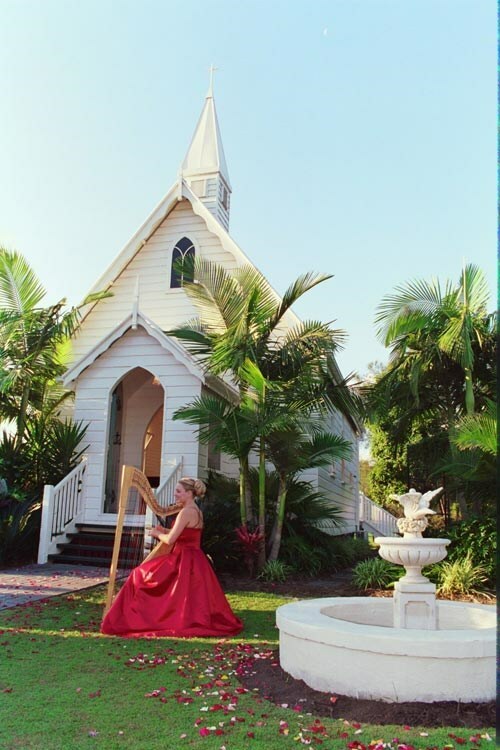 World-class events spaces in Byron Bay. 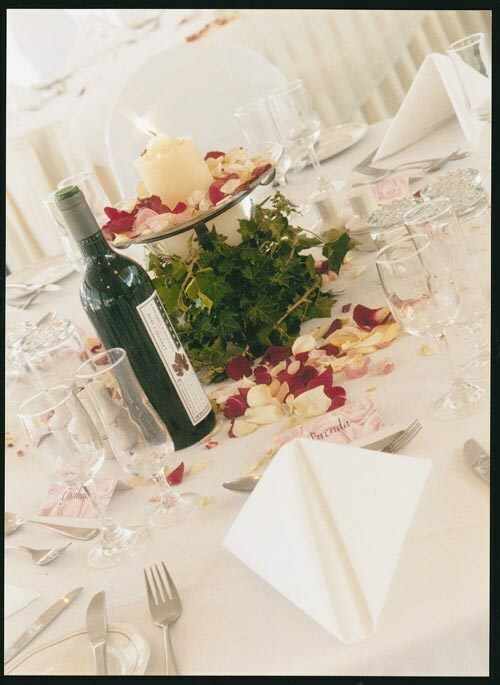 Go beyond the wow factor in state-of-the-art indoor and outdoor venues. A place to create unforgettable conference, events and incentive success. Emerald Lakes, was designed by world renowned golf course architect - Graham Marsh. It is an enjoyable par 72 championship and will test the skills of every golfer. 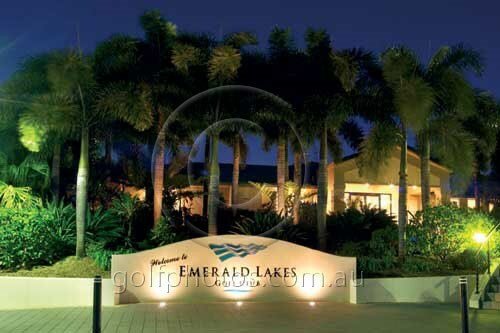 Emerald Lakes has installed floodlights on the back nine holes, creating a par 36 floodlit game. This course is one of few in the world that can be played day and night. The Glades boasts superb agronomy that is unique to the area. In particular the greens consist of a "Tropical Bent" grass that was specially developed for the Glades. This grass will ensure a superior putting surface for the entire year. In his design, Greg Norman not only had a vision to create a challenging golf course, but he also retained 9 hectares of wetland area to create a natural wildlife sanctuary within the course. The Glades greens are unique to any other golf course on the Gold Coast and will ensure a superior putting surface all year round as they consist of a new type of “Creeping bent grass” that offers a true putting surface and is the preference of professionals and amateurs alike. 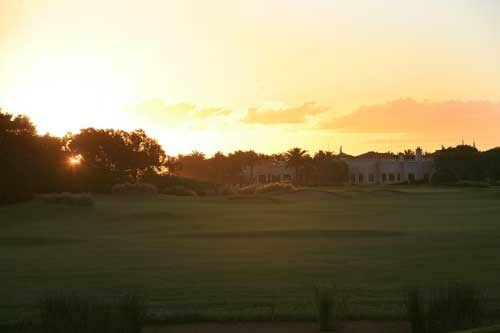 The Glades is a par 72, 6420 metre championship course that spans 65 hectares of land. 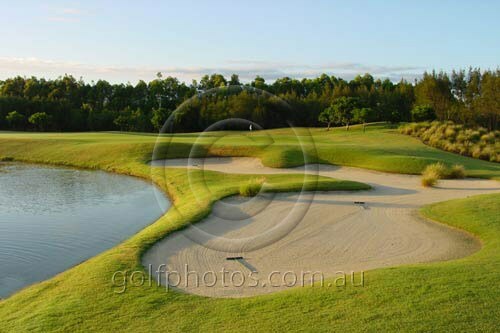 Greg Norman is renowned for his bunkering worldwide and the Glades does not disappoint with a total of 98 bunkers. Greg not only had a vision to create a challenging golf course on the Gold Coast, but he also retained 9 hectares of wetland area to create a natural wildlife sanctuary within the course. A straight forward par four, a gentle way to start the round. Forgiving off the tee with more room to the right than suspected. A good tee-shot leaves less than 130m for most players. A fat green makes for a large landing area. Playing tip: Aim to the right side of the fairway to leave yourself a good chance of reaching the green in two. A tough, long, par four with a water carry and a well-protected green. The Green is protected with large bunkers to the right and a steep bank to the left which leaves little room for error. Playing Tip: Off the tee, the left side of the fairway means the smallest water carry and best angle to the green. The large green makes for quite a simple par 3. The right hand side is the trouble spot, large bunkers make for a difficult up and down and the breeze will often push the ball toward them. Playing tip: Miss left if anywhere. This short par 4 has the smallest green on the course. The fairway runs a ridge down the middle, too far right and its wet. Playing Tip: Aim at “Toddy’s Tree” (the last tree on the left), leave yourself 100-110 metres and play a pitching or sand-wedge to the green. An extensive waste bunker down the left hand side is a scare factor on this hole. The green is generous in size and slopes globally from front to back. Playing tip: Hitting an approach to the right side of the green will lead the ball to roll toward the centre. The first par 5 on the course. The large fairway is very generous for all golfers. A slight dog leg right and large obvious fairway bunkers all the way down the hole. One little secret: a sneaky greenside bunker hidden behind the large left bunker. Playing tip: Miss the bunkers! Easy. A three shot par 5 this time. The tee shot needs to pierce two fairway bunkers. Miss the water on the right with room to the left of the second fairway bunker. The green is heavily guarded by large bunkers and only a small chute to run the ball up if that’s your strategy. Playing tip: Take 3 shots to get there. The hardest hole this side, mainly due to its length for a par 4. Hitting to in line with the cactus tree will still leave 160-180 metres, uphill and usually into the wind. Playing tip: Think about taking an extra club up the hill. Water all down the left with a fairway that cambers toward it. The sweeping dog leg left hole plays again to a slightly elevated green. This green plays almost three clubs in depth (35 metres) but attacking a back pin is a risk as behind the green lays a steep slope into swan and duck territory. Playing tip: Block the water out! Hit toward the fairway bunkers that are a bit further away than you think. Par 5 number three. A large landing zone to the right of the hazard, or cut the corner if you dare. Reachable in two for the big hitters. Dog leg left and more fairway bunkers thanks to Norman. The last par 5. A strong drive down the left side is a good start. Staying left on the fairway opening up the narrow slanting green is the best option. Playing tip: Left is best. A strong par 3 up the hill. A large green can leave a tricky putt if on the wrong tier. Playing Tip: Potential for an extra club up the hill? From an elevated tee the hole plays all downhill. Not much trouble here unless the wind is blowing from the West. Playing tip: Rip the driver into one of the widest fairways on the course. Narrow tough par 4. 15 is well protected with the right side bunker and tree giving no good options. All hazard down the left. Playing tip: A long an reasonably forgiving green. Just be straight for this hole. Another short par 4. The water hazard is obvious. It is manageable for big hitters to take on the carry. Laying up onto the fairway is another way to make an easy 4. Playing tip: Be smart unless you’re hitting driver well. Take hybrid or 4 iron and then hit a wedge close. Glades signature par 3. Left is wet. Right means a tricky shot back towards the water. Playing Tips: Requires a well struck tee shot. One of the quicker greens on the course if putting toward the water. The hardest hole to finish. The long par 4 dog legs left with water all down the left. A strong drive will still leave a mid iron for most players. Playing tip: Take an extra club into the green, a false front will stop most balls from staying on the green. 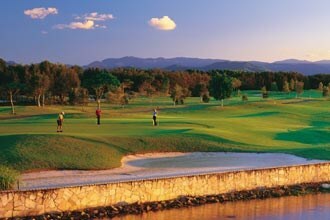 Lakelands offers many great golf experiences for golfers travelling to the Gold Coast. It is Jack Nicklauss 1st signature course in Australia and is immaculately spruced. The Windsor Green couch fairways are neat and well groomed, while the hardy Bermuda-strain tifdwarf greens are firm and roll honestly. 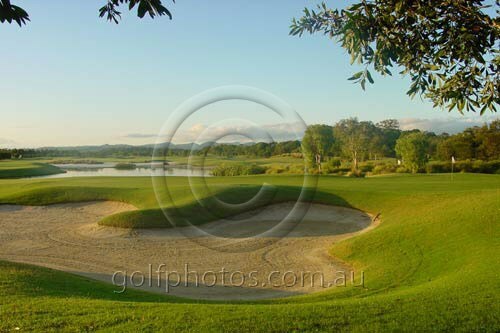 Located ten minutes west from the heart of Surfers Paradise, between the white sandy beaches of the Gold Coast and the Hinterland's sub-tropical rainforests, is Australia's first Jack Nicklaus Signature golf course -- Lakelands Golf Club. Ranked in the 2004 top 50 Australian courses by the Australian Golf Digest, Lakelands offers many great golf experiences for golfers travelling to the Gold Coast. It took twenty five years for Jack Nicklaus to find the perfect location for his first signature golf course in Australia.and the vision is now a reality. Built by Leighton Contractors under the watchful eye of the Golden Bear Construction team, Lakelands is immaculately spruced. The Windsor Green couch fairways are neat and well groomed, while the hardy Bermuda-strain tifdwarf greens are firm and roll honestly. There are five different tee markers on each hole, so golfers of all standards can test every part of their game. Extensive practice facility with five target greens and undercover hitting bays for inclement weather are also a key feature of the great facilities that Lakelands has to offer. A driver is suitable here, hit left centre of fairway. Approach the green from left to stay clear of large greenside bunker on right. A good drive backed up with a strong fairway wood right centre of the fairway (watch the bunker!) sets a good third shot approach to all pin placements on a large green. Correct club selection is important here as green has bunkers front and back. If you miss green, short left is your best option. Your drive to right centre of the fairway will avoid a group of fairway bunkers on left and open up the green. Club selection on approach shot is important and is normally one more than it looks. After reaching the fairway, the second shot should be aimed to the left hand side of the fairway to set up a short iron to the narrow green. Aim away from the deep greenside bunker. Hit enough club to carry front greenside bunker. Front left is a safe option. Must hit your drive left centre of fairway to stay clear of right fairway bunker. A high approach shot is required to stop the ball on this plateau green. Avoid the left hand greenside bunker. A drive between the centre and right hand bunkers will open up the green and take the water carry out of play. Club selection for the shot to the green is important as it is well bunkered front right and rear. There is ample fairway to the left hand side which will avoid bunkers and leave a mid to long iron to this large green, which slopes back to front. A strong drive right centre of fairway ensures you don’t flirt with the water, however, this does provide a more difficult shot to the green. The green is well bunkered front right and back left. A long drive right centre of fairway will leave you in good position for options. The safe approach is to lay-up right side of fairway to take the left side fairway bunkers out of play. Wind direction determines the difficulty of this hole. A courageous drive left centre of fairway will leave you in a good position to attack the flag. Your approach shot has to be very accurate with water cutting into green on right hand side. A difficult par 4 which requires a strong drive to the middle of the fairway, followed by a long iron approach. Take note of the fairway bunker to the right and the extensive greenside bunkers. This feature hole will leave you with many options. Ensure club selection suits the pin placement and wind direction. Best of luck! A well hit drive down the centre of fairway (don’t be right!) will leave you with your best approach. An extensively bunkered green front left and back right will test your approach skills. Hit centre left with your driver to set up options for your approach. Safe option is to hit second shot between left side fairway bunker and centre fairway bunker which opens up green for a pitch approach. Note the distances for this hole as club selection is vital to avoid front right and greenside bunkers. There are bail out areas to the right and behind the green. A long drive down left centre of fairway opens up this large green for a cautious approach. The well bunkered right hand side of the green should be avoided. The golf course at Hope Island Resort is an 18 hole championship course designed by five times British Open champion Peter Thomson and the team at Thomson, Wolveridge and Perrett. The layout and design of the course is reminiscent of the great courses of Britain and Ireland in the "Links-style" tradition. The golf course at Hope Island Resort is an 18 hole traditional "links" style championship course designed by five times British Open champion Peter Thomson and the team at Thomson, Wolveridge and Perrett. The course has been given a course rating of 74 by the AGU. The layout and design of the course is reminiscent of the great courses of Britain and Ireland in the "Links-style" tradition. Primarily the course consists of two loops of nine holes. The front nine starts off to the southeast in an anticlockwise direction. The back nine heads off in a southwesterly direction, finishing with an interesting challenging two holes bounded by the non-tidal lake. The front and back nines are separated by an extensive practice facility, consisting of putting greens, a driving range and chipping green with bunkers. The driving range is unique in that it takes the concept of a driving lake, complete with target greens with bunkers at various distances from the practice tee. 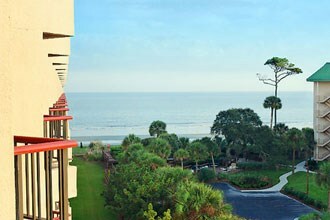 This area provides a spectacular view from the clubhouse. In various positions around the back nine holes of the golf course, chipping and putting courses are available for residents use. The first hole is an Ode to joy, with a wide fairway and no bunkers to worry about. Nor is the green so fiercely guarded. Yet it has subtlety that is deceptive. It is advisable to travel down the left side which offers a better chance of approaching the green without bother. Coming at it from the right-hand side might present some difficulty, depending on the position of the flag. Now begins the examination, the road test, because this is a hole only the mighty can reach in two, because the green is raised and not all that large. There is no way around its difficulty as you must be straight, and long. Bunkers to the right and left and further a tree or two. Patience though will pay dividends. Five will be well earned. Here is one of the best par three holes anywhere. The bunkers are deep and imposing and the getting of the green in one shot, is an accomplishment to boast of. Beware of the deceptive early bunkers, they are well short of the green. But between them and the target is a safe reception. To be short is not so foolish. This can be a problem par four, as the obstacles ahead are many and to be wild here is certain disaster. Tread carefully. even shortening down from the tee, to keep out of danger. From the halfway point it is defenceless and simple. This is the "Pulpit" from which one can look around and down to trouble of all kinds. For a hole so short, the green is necessarily small and some pinpoint accuracy is required. If your confidence is low, play left and short. Three can be had from there. This is a change of direction and strength, for here is a powerfull par four. There is a serious trial of a tee shot with bunkers straight ahead, but out of range of most. A small bunker at the front of the green challenges the second shot with steep sloping sides to the rest of the green. Again it is no sin to be playing short. There is not trouble there. This is what might be called a "drive and pitch" hole, but that depends on the wind. The fairway bottlenecks around the 280 metre range, so that its hardly worth the risk. The green is a ridge of no real depth, but putting is possible from out and about. A hole for men not boys. A par five with plenty of action. There are 8 bunkers along this hole, the first pair being an inspiration from the Principal's Nose at St Andrew's. Once past these it is advisable to proceed down the left side and ignore the green untill you get within close range. Those further bunkers are designed to cause trouble for the audatious. Here is a picture all round, with the beautiful clubhouse as a backdrop. Par fours don't come any more adventurous than this one. For the long drivers there is a challenge from the tee to squeeze between bunkers, so it is better to go warily. The second shot has to be good to make ready for putting. No apologies for difficulty. A par is a capital score. Keep left where there is a vast space and the passage peaceful. Just one bunker at the green to avoid, but be warned it is a demon! Putting is enjoyably flat. No borrows needed. This is a hole of ridges and length. Yet all the troubles are there to see. Nothing of consequence is hidden, so hit forward with confidence over bunkers and rough. There is a wide area waiting ahead. Indeed the anti-area is generous in width, from which to make one's pitch-approach. The green is another flat one. Make the most of it! A short par four, but made especially difficult by the fairway bunkering which is a minefield! There are two hidden bunkers along the right-hand line, so keep left and there should be no problem. The short approach is to a two level green. There are some interesting small undulations on both sides. Now the going gets tough. A par four with lots of danger. There is a reward for driving past the fairway bunkers on the left, but consider if it is worth the risk. If you play short from the tee, the second shot is a real tester! The bunkers and the green will look you right in the eye. Wear a four proudly. A deceptive par three with lots of generous space around the green. Yet the green is a small target tilted right to left. It is possible to putt up from the area to the right of the green but the chances of down-in-one are slim indeed. If you miss the green, miss short left, or not at all! This may be the most difficult of all the holes depending on the wind. There is plenty of length. The fairway is bunkered right and mostly left, but the real test comes with the second shot. The green is set in a dell beyond a ridge and it sits up like a table top. This hole puts everyone to the severest test, so don't be disappointed with a five, fours are rare. A temptation to drive near the green. But the penalty for missing the tiny gap is heavy. Best play along the right-hand route and take on the pitch to the green from a distance out. Keep out of the greenside pot too, it is a deep devil! Your breath may be taken away, and the wind may be into your teeth but the spectacular vista is worth it. From the back tee, most players cannot reach the green into a wind. So it is advisable to consider playing this hole as a par four instead of a three. There is a small fairway to the short right area, from where it is a simple pitch to the green. Whatever befalls you, this is an experience in courage or folly. You decide. What a view. A long journey "home", with plenty to see and avoid. Keep right and you'll find no trouble, and at the end there is a mall green surrounded by bunkers and a hollow out front. This is the terminus and it is hoped you'll not be disappointed. 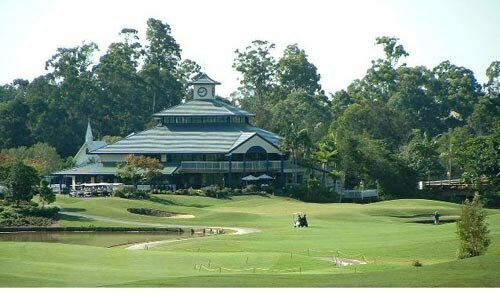 Palm Meadows was carved out of 350 hectares of scrub and bush on the edge of the Nerang River, designed by leading Australian golfer and course architect, Graham Marsh. Today, the picturesque course, with water impacting on 14 holes, and 82 sand bunkers, is an environmental success story, playing all year round, even after the heaviest of rain or crippling drought conditions. 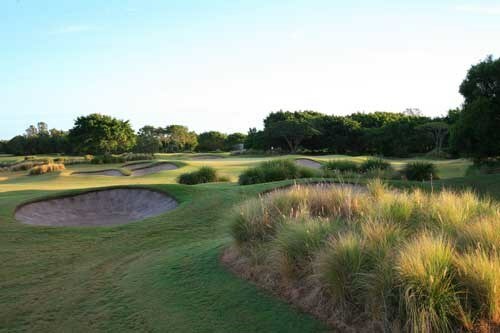 Designed by leading Australian golfer Graham Marsh, Palm Meadows was one of the first championship courses on the Gold Coast. Palm Meadows emerged from 350 hectares of marshland, just a few kilometres west of Surfers Paradise. A par 72 measuring 6319 metres off the championship tees with water coming into play on 14 of the holes, along with 82 sand bunkers. 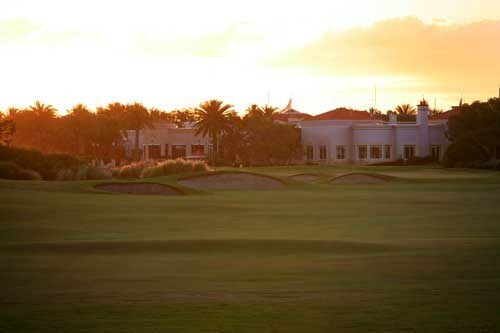 There are eleven kilometres of cart paths bordering all fairways making Palm Meadows an all weather golf course. The first hole is regarded by many as one of the worlds most challenging opening holes. With water running the entire length of the hole on the left and the world famous 'Bamboo Curtain' on the right, golfers must have their 'A Game' from the first shot of the day. The signature hole at Palm Meadows is the world famous 18th hole. Measuring 523 metres from the championship tees, the player has the opportunity to chance their arm as to how much of the dogleg right they want to cut off. Curtis Strange, well aware of his capabilities during the playoff with Roger Davis for the 1990 Palm Meadows Cup, took the long way home. Davis however did not, and it goes to say Davis eagled the hole and took home first place, how much do you dare? In 2000 the 18th hole was rated by the American Golf Magazine as one of the top 500 golf holes in the world. Palm Meadows are able to offer very competitive group rates incorporating food and beverage packages of all shapes and design. With Palm Meadows extensive hospitality facilities any request from sandwiches up to 4 course sit down meals are available to the golfer. Palm Meadows is also famous for Neilsens restaurant on the top floor of our magnificent club house. 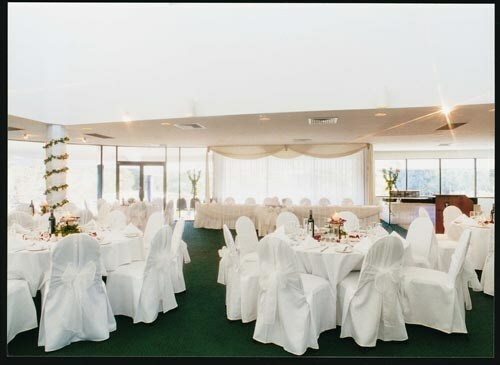 Its wide sweeping views make it a favourite for corporate and conference groups and in particular our award winning weddings. The Pro Shop at Palm Meadows is extensively equipped with a wide range of merchandise to suit both the discerning buyer or those seeking the simplest of souvenirs. Many unique items are available. Palm Meadows logo'd shirts ranging from local product to imported lines, with a large range of men's and ladies shoes complimenting the many fashions available. Pro Shop staff pride themselves on helpful service and extensive product knowledge to ensure your shopping experience is an enjoyable one. Palm Meadows is a completely public course and as such there are no tee times reserved for members. Golfers are able to enjoy the facilities at anytime, however bookings are advisable to avoid disappointment. 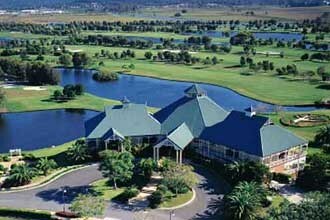 When planning your next golfing expedition to the Gold Coast remember to experience Palm Meadows for yourself. We know you won't be disappointed. Palm Meadows has hosted many greats - Greg Norman, Curtis Strange, Nick Faldo and the late Payne Stewart. A strong opening hole. Water to the left and a menacing clump of bamboo on the right at driving length awaits the slightly pushed or sliced drive. Bunkers down the left side at driving length will catch any stray shots, water runs down the right. Aim the drive just to the right of the fairway bunkers on the left and you will have only a short iron shot to the green. The first of the par fives and an excellent birdie opportunity for the long straight hitters. Centre or right centre of the fairway is the best positioning for the tee shot. The green is long and narrow at the rear so only the perfectly struck second shot will find the target. Beware of the subtle undulations on and around the green. A long par 4 doglegs left. Bunkers and palms guard the left corner and should encourage you to drive to the right, which is the perfect position from which to approach the green. As with all the par 3's at Palm Meadows this one varies dramatically with tee and pin positions on the day. Whether the pin is forward or back left or right on the green it is always well guarded with bunkers. Large fairway bunker forces play to the right where accurate driving is necessary to avoid the bunker on the left. Water and another bamboo clump lie to the right. Cautious second shot across water finishes off this hole nicely. Strategically placed bunkers at driving length make you think carefully about your line from the tee. The second shot is to a long tightly bunkered green and requires precise club selection to set up the birdie opportunity. When the pin is to the left the bunkers and water come into play. When it is on the right side the hole it plays slightly longer and is equally difficult with well-positioned palms and bunkers protecting the green. Water on the left from tee to green catches any shots headed left other than a slight draw. Most players will have to play short of the greenside lake. The approach to a slightly elevated undulating green is well guarded on all sides by bunkers. A powerful straight drive between the bunkers and palms sets up the long iron second shot. Position the second shot short and left of the green to gain the best angle of approach. There is plenty of room on the back half of the green behind the lake if you decide to play safe but prepare for a long tricky putt if you leave yourself too far from the hole. Water to the right is in play if you fade the tee shot. Bunkers catch the pulled or hooked shot. From a well positioned drive a medium to long iron is required to a long narrow green. Avoid the cross-bunkers otherwise you will almost certainly make a bogey or more. From a well struck drive the second shot is only a short iron to a slightly elevated green. Keep the tee shot down the right centre of the fairway avoiding the bunkers on the left. You'll need a straight second shot to miss the trouble either side of the long narrow green. Another excellent birdie opportunity exists here. A long straight drive to the corner of the dog-leg left creates the perfect second shot angle. Don't be fooled by the fairway bunker you can see short of the green. There are many more to the left and beyond awaiting any shot, which strays left. Try to aim the second shot to the right side of the green. The best approach angle is from the right. Aim just left of the right side fairway bunkers and try to gain as much distance as possible. The second shot will still be a long iron or fairway wood. Bunkers to the right of the green catch most balls headed right. A classic long short hole. A miss to the left or right from the tee will result in difficult approach or bunker shot onto a heavily undulating green. The ultimate test and one of the Gold Coast’s ultimate holes! The challenge comes in knowing your ability. How much of the lake you wish to carry is entirely up to you. If you cannot reach the green in two you must keep out of the bunkers on the left when you lay up with your second shot short of the water. The final hurdle is judging the third shot just right to avoid taking no more than two putts on the tiered putting surface. You will want to go back and play this beauty again and again. 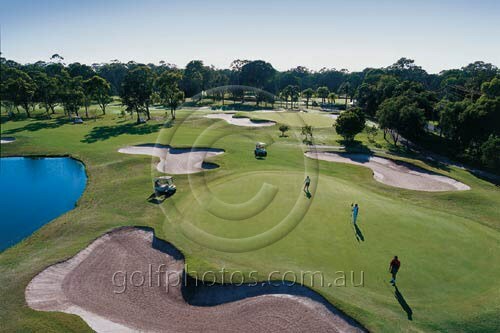 Built by Nara Australia Pty Ltd, The Colonial Golf Course originally opened as Paradise Springs Golf Course in 1992. Designed by Mitsuaki Kobayashi, boasts of beautifully groomed fairways and meticulously manicured greens, widely regarded as being in the best condition on the Gold Coast. 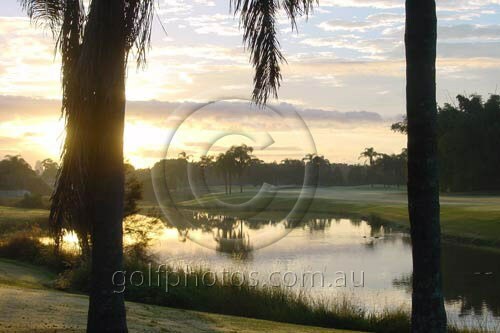 Built by Nara Australia Pty Ltd, the course opened as Paradise Springs Golf Course in 1992. Designed by Mitsuaki Kobayashi, boasts of beautifully groomed fairways and meticulously manicured greens, widely regarded as being in the best condition on the Gold Coast. 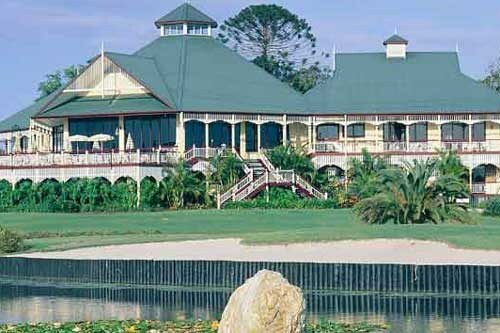 The distinguishing feature of the course is the clubhouse, with its Colonial, Queenslander design. Designed by Alan Griffith Architects, it continues to be the focus of the venue and was the inspiration behind the new "The Colonial Golf Course" name and logo design. In October of 2003, the course was officially renamed to be known as "The Colonial Golf Course". A farmland once home to cows, weeds and bush has been transformed into a beautifully groomed course with lush fairways and meticulously manicured greens. The 6,424 meter, par 72, championship resort layout, meanders its way through 39 hectares of towering eucalyptus, picturesque lakes and serene waterways. Flowering native and exotic trees and plants abound, while ornate bridges cross watercourses in which luxuriant lilies jostle for space. 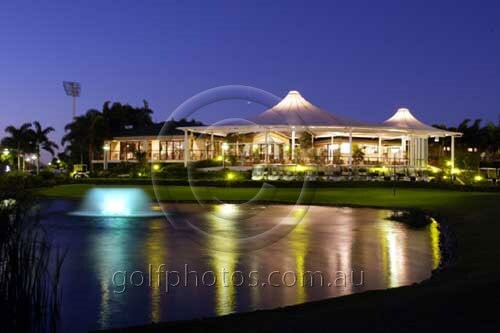 Off the course, the stunning Queenslander-style clubhouse welcomes both golfers and visitors alike. Wide, breeze-catching verandahs surround the building, offering wide views over the golf course and the Gold Coast Hinterland. Long straight hole. Good opening hole where you can have a hit out. Comfortable par 5. A good drive here will enable the long hitters to reach the green in two setting up an eagle chance. Plenty of concentration needed to position a good drive down the fairway as water covers all the left side, all the way down to the green. A very pretty water carry par 3 hole. For the brave an accurate hit across the water can be rewarded with a satisfying birdie, careful of the bunker left and behind. Tough driving hole with water both left and right of the fairway. One the shorter par 4s on the course, but a tight driving hole where water comes into play again down the left side. A large green should allow you to walk off with a comfortable par. Another beautiful looking par 3, with a huge gum tree as you line up to play across the water to a generous sized green. A good drive could tempt the longer hitters to have a go at the green, but if they miss it they will be adding a penalty shot for not carrying the water. For the smart golfer a drive towards the bunkers on the left side of the fairway, then a mid iron to lay up will wet up a good birdie chance. For the par 4 you will need your best drive and a good second shot to reach this very large green. A fairly straightaway par 4 with bunkers on the right side of the fairway to cover your drive. A good second shot to the well-trapped green should see you earn a well-earned par. The water down the right side of the fairway might steer you toward the bunkers on the left side of the fairway. However, a well-positioned drive and fairway wood will set up a birdie chance. A water carry hole to a two-tier green, with more water through the back. The shorter hitters will be happy to lay-up to the left on the green and hope to play a good chip shot for a chance at their par. One of the prettiest holes on the course, with water skirting the right side of the fairway and huge gum trees on the left side of the fairway, short of the green. A well positioned drive will allow you to play a short iron into a very receptive green. Although one of the shortest par 4s on the course, you will have to be wary of the water on the right side of the fairway and the bunkers well positioned down the left side. Perhaps a tee shot for position would allow you to play a short iron to the green with the clubhouse in the background. Most players would agree, this is the best hole on the course. When you stand on the tee, you face an extremely tight driving hole, with water bounding the right of this dog-leg hole and huge gum trees to the left. The player will have to be very wary as to how much water to drive over, as too far to the left will leave a deadly shot through the gum trees to a well bunkered green. If you drive the ball well here a good mid iron will get you to the green. Another good par 3 hole, with water coming into play down the left side and playing to a well bunkered, but very large green. The longest par 5 on the course will require three of your best shots to reach the green in regulation figures. Perhaps the shortest par 4 on the course with water on the right side of the fairway. The longer hitters will have the lay-up to play a short approach to this, almost, island green. A pretty hole, once again, with a bunker skirting the far side of the lake. 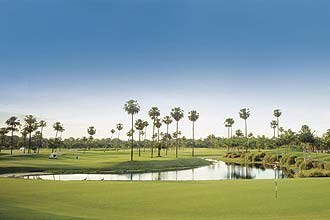 The golfing experience at Royal Pines Resort is comprised of three distinct courses that are designed to challenge the players every stroke. This championship course has undulating terrain, magnificent greens, and tight fairways with bunkers that demand respect. 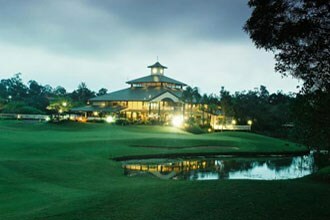 Home to the ANZ Ladies Masters since 1992, Royal Pines Resort boasts a world-class golf course that gives golfers the opportunity to experience conditions usually reserved for champions. 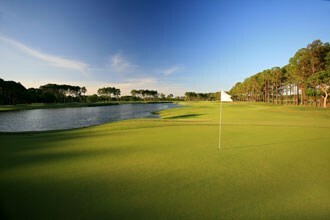 The golfing experience at Royal Pines Resort is comprised of three distinct courses that are designed to challenge the players every stroke. This championship course has undulating terrain, magnificent greens, and tight fairways with bunkers that demand respect. Home to the ANZ Ladies Masters since 1992, Royal Pines Resort boasts a world-class golf course that gives golfers the opportunity to experience conditions usually reserved for champions. 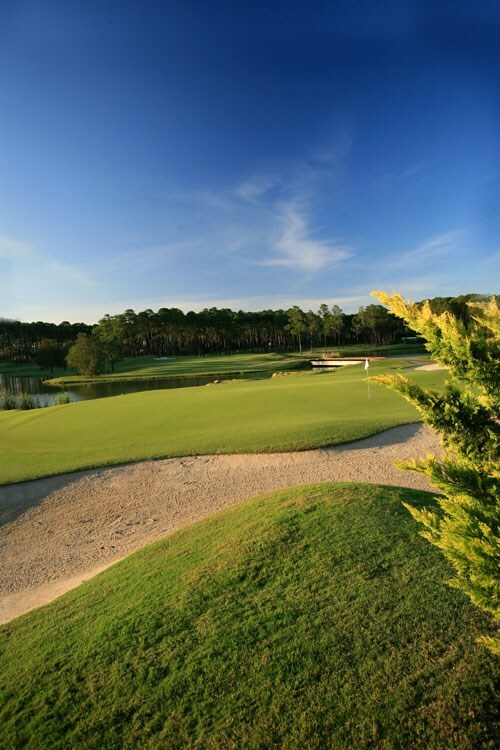 With three distinct 9hole courses to combine, Royal Pines Resort is the golf encounter you've been waiting for. Also available is a daytime driving range, chipping and putting greens, on course refreshment van and complimentary golf carts. 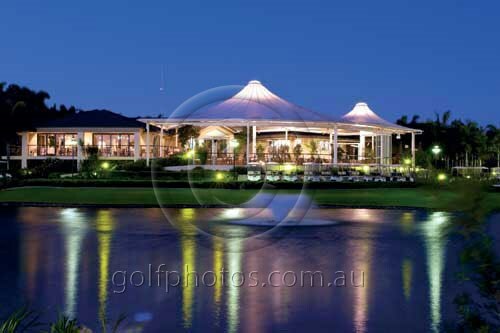 The flowing waters of the Nerang River gently frame the Aroona Course with both fresh and salt-water lakes coming into play on nine of the eighteen holes. Embraced by lush native vegetation and the beautifully manicured gardens of our Eastside residential precinct, Binnowee is a golfing oasis of emerald greens and hidden challenges. To finish, a testing final nine holes combines deep bunkers with undulation greens and challenging fairways to provide an all-encompassing golf experience. The westerly aspect of Wangara captures the best of both worlds the first nine holes are shaped around natural land formations with undulating greens and less forgiving fairways. It is however, the generous greens and wide-open fairways on the final nine holes that create a truly majestic golfing experience. 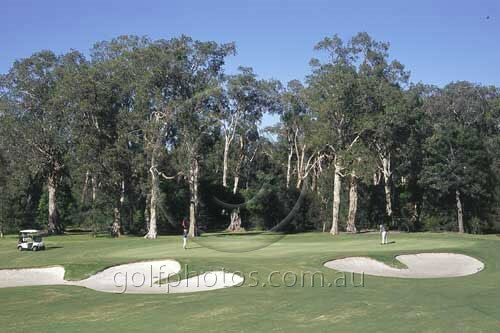 Robina Woods was carved out of 65 hectares of native woodlands, with fairways lined by towering gum trees. This unique layout is unlike any resort course on the Gold Coast. Possessing maturity well beyond its years, Robina Woods has rapidly developed a reputation as one of Queenslands best-loved resort courses. Robina Woods Golf Course opened in January of 1990. Designed by Graham Marsh & Ross Watson, this course presents a truly unique golfing experience as it has been carved out of the original woodlands, making every hole a unique challenge for any accomplished golfer. Carved out of 65 hectares of native woodlands, with fairways lined by towering gum trees, this unique layout is unlike any resort course on the Gold Coast. Possessing maturity well beyond its years, Robina Woods has rapidly developed a reputation as one of Queensland's best-loved resort courses. 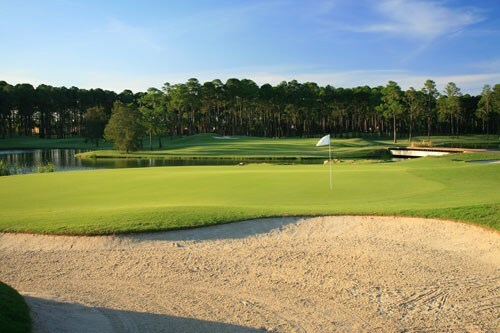 Consistently ranked in the top 25 resort courses in the country, Robina Woods is a 6078 meter, 18 hole, Par 71 championship golf course, designed by the Marsh / Watson team. 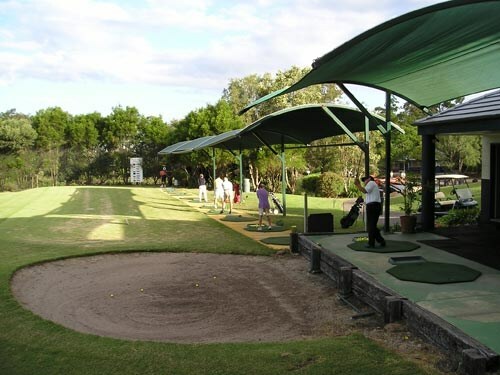 The facility features a fleet of electric carts, two tennis courts, driving range with sun protection cover and practice facilities, golf shop fully stocked with the latest equipment & merchandise, a club bar & bistro which includes alfresco dining on the terrace, as well as the Fairway and the Lakeview function rooms. With bunkers left and water hazard all along right, a straight tee shot is require here. Loosen up and relax before hitting. Green nearly four clubs deep check pin position for club selestion for the shot in tot his narrow green. Rocky creek crossing the fairway reachable by long hitters or with tail wind. Many humps and hollows just short of creek. Club for accuracy off the tee, not length. Beware aware left of fairway. Another long and narrow green requires a straight shot in. Aim left centre fairway of the tee ti get extra roll and avoid bunker right. A solid fairway wood second shot will open up the green. The long and narrow green calls for careful club selection and a straight shot. Bunkers short and left. A blind shot from the lower tees. With the pin cut right safe shot is for centre green aim for left hand house roof. Check tree tops for wind you may be sheltered on the lower tees. Over-hitting the green can be very costly due to the steep slope. Left centre fairway is the ideal line to open up the green. Trouble at back and right of this oblique green where steep greens can cause a dropped shot. Two-tiered green try to be on the same level as the pin for an easy put. A well hit fairway wood or a long iron down the centre will open up the green on this lovely par 4 dog-leg. Huge hummocks ti the left of fairway may hamper long drivers. Be up for the second shot water front and right of green. Aim centre to centre right fairway for safety on this dog-leg left. Fairway bunker in range. Landing short of this green the ball may stop due to the steep slope be up but beware out of bounds behind green. Bunkers right, humps and hollow left and the slope at the back of the green will test your club selection. Carefully check distance from daily markers and for any wind. A tough par 4. You must middle your drive water left and bunker right will penalise anything off line. Another well hit shot required into green slopes left run to the water and bunkers short and right will test your iron play. A generous landing area makes for an easy tee shot. Deep humps and hollows left of green and a bunker right penalise an offline shot into the green. Note pin position a prominent ridge across the green will toughen up your putt if not on the same level. Tee shot down the middle of the fairway opens up the green. Beware, bunker left is in range of the tee. Water and sand to the right of this oblique green. Play left green for safety if the pin is cut to the right. Green nearly four clubs deep check pin position for club selection. A hook or draw will find the bunkers left and with a bunker right as well there is a premium on straight hitting here. Significant slope at the back of the green think your putt out carefully. No great length required on this short par 4. Fairway bunker is in range; consider a lay up to avoid trouble. An elevated green with sloped at the back and sides tests you shot in here. Club selection again vital due to depth of green. A definite lay up hole with bunkers and water in range and a narrowing landing area. Most trouble short of this green; check the distance carefully to reach the green in safety. Prominent ridge across the green. A hole to play with your head dont gamble. A drive down the centre is the safest play. A very long elevated green makes this a truly testing par 4. Check pin position, distance and wind for the vital club selection. Favour the right side of the fairway off the tee to gain extra distance. For the second shot left fairway opens up the green. Pin position affects your clubbing into the green check it out! Deep hollows left of the bunkers right. Take your pick or hit straight. Highest point of the golf course. With the pin cut right, better long than short due to the deep bunker guarding front green. A ridge divides this undulating green and there is a significant slope from the back, which calls for careful alignment off your putt. Long straight drive required, bunkers left may catch a hooked shot. Plan your second shot carefully, water right and left comes into play depending where your drive finished. For the shot in, left green is the safest play, the ball will roll back to the centre. 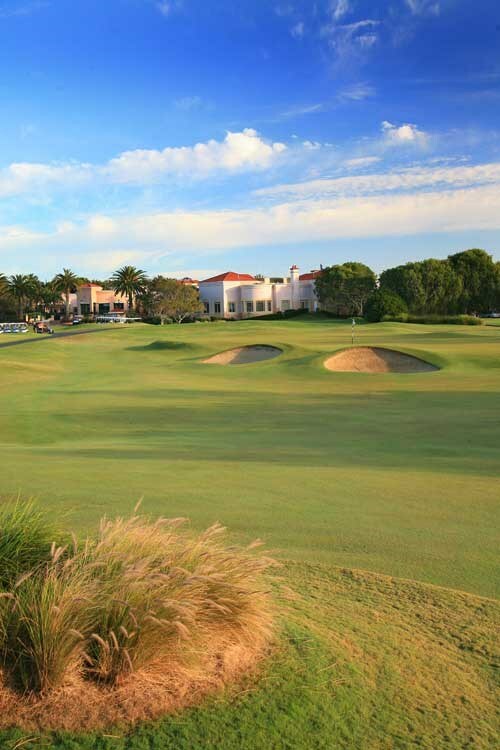 Sanctuary Cove, The Palms and The Pines offer undulating fairways, challenging bunkers, water hazards and a test of golf for any avid golfer including Sanctuary Cove's touring professional, Adam Scott. 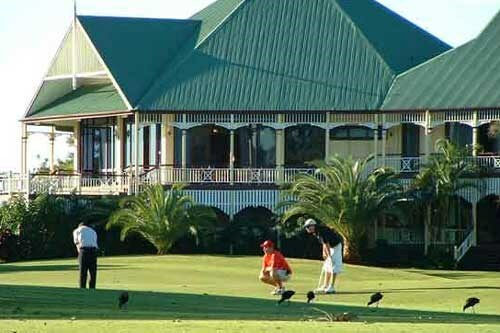 These 18-hole championship golf courses are considered two of the best resort courses in Queensland, and includes an all-weather day/night driving range, Golf Centre, practice greens and Golf Academy. The MercedesTrophy National Final is being played over two courses at Sanctuary Cove on the fabulous Gold Coast. Below is a summary of each course. 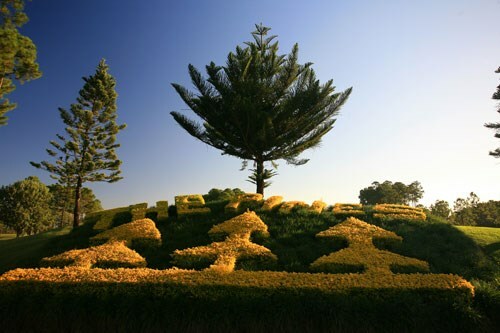 The Pines Golf Course is the only Arnold Palmer Signature golf course in Australia and is rated by the Golf Australia as one of the Nation's most challenging courses. In the words of Sanctuary Cove's touring professional, Adam Scott, "When I think of great golf in Australia, I think of The Pines at Sanctuary Cove, a true test of the game". 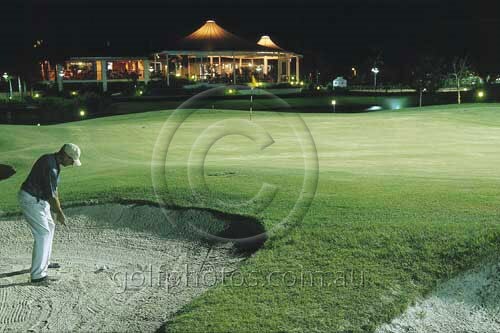 With a Golf Australia rating of 76 the course offers a very special golfing experience. Fourteen of the holes are contoured around six man-made lakes. The Palms Golf Course has recently undergone a major redevelopment and was redesigned by renowned golf course architect Ross Watson. 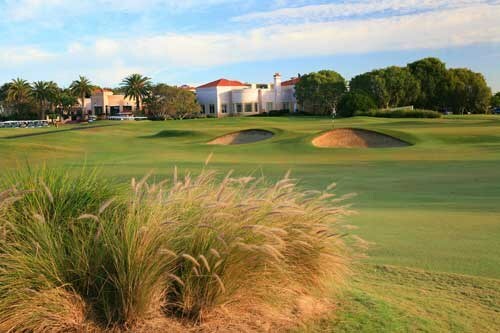 After its reopening in April 2011, The Palms is considered a championship course rivalling some of the best golf courses in Australia. 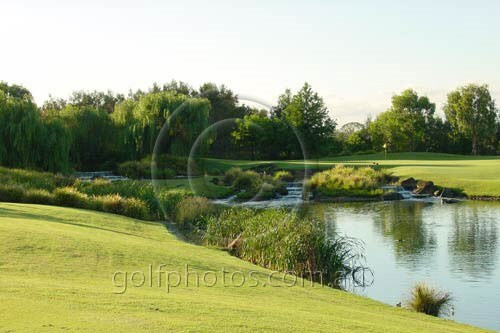 It has a total length of 5904 metres off the back tees, and numerous water features and hazards. 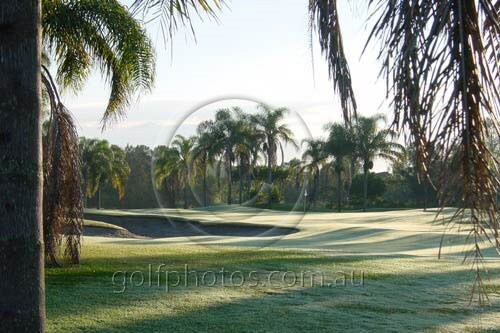 Sanctuary Cove, The Palms offers undulating fairways, challenging bunkers, water hazards and century-old Cabbage Palms, The Palms is a must for any avid golfer including Sanctuary Coves touring professional, Adam Scott. 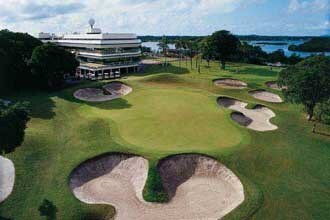 The 18-hole championship golf course is considered one of the best resort courses in Queensland. 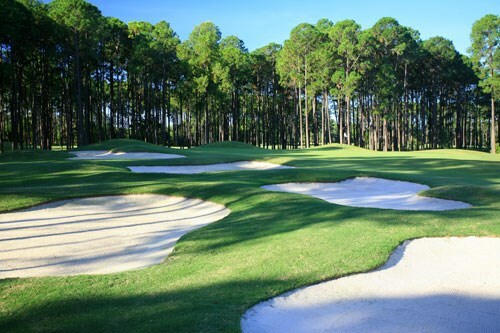 Award winning The Palms golf course is designed around century-old groves of cabbage palms. 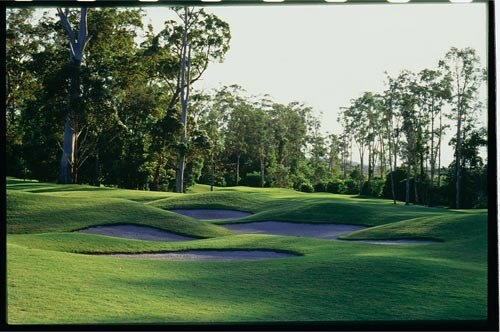 Considered one of the best courses in Queensland, the 5904 metre course has a par of 70 and a rating of 70. Leading brand clubs are available for hire. Practice putting greens are located near The Palms' first hole. Dogleg left to a blind green with water on the right and out of bounds to the left. The play is a tee shot to the left side of the fairway short of the ridge, to leave a short iron onto a very elevated green. A deep bunker in the front right and also water to the right will catch any errant shot. Short downhill Par 3 with water guarding the right side of the green and a small pot bunker to the front centre. A shot to the left of the bunker has a chance to roll around and catch the rear of the green. Green is steeply sloping, angled towards the water. A putt from the top tier could roll off the green into the water. Another great short Par 4 with sand everywhere and water all down the right hand side. Layup short of the cross bunkers to leave a short iron onto a small tiered green surrounded by water. Small layup area to the left of the green will still leave a difficult chip. Anything over the back is in the water. Good Par 5 which can be challenged by the longer hitter with a 230m drive over the water. Safe play is a shot to the left around the water, with a long iron second over the fairway cross bunkers, to leave a short iron onto the green which is protected by six bunkers. Long Par 4 requiring a well struck tee shot to the right side of the fairway avoiding the large fairway bunker. Mid iron onto an elevated green with bunkers front, left and right. Long green with steep drop off to the right and rear. Fine looking Par 3 with all carry over water from the back tee. Bunkers left and right protect the front of the green. Any shot right is likely to find water. Lay up short left for an easy chip up the green. Dogleg left requiring length and accuracy. Drive to the left to allow a clear shot at the green, avoiding the small pot bunker in the middle of the fairway. then a mid to long iron onto an elevated green with a bunker guarding the left and water on the right. Great hole which requires a drive to the left side of the fairway short of the fairway cross bunker. Next a mid iron to an elevated green with large deep bunkers left and right. Water protects the green right and era. A quality approach shot is needed to a sloping green for a rewarding Par 4 finish. A strong hole with water to the left and right. Long hitters can attempt a drive down the right side of the fairway over the cross bunkers to leave a long iron to the green. Anything less than a perfect shot will be punished, with water to the right and deep pot bunkers to catch an errant shot. Safe play is a drive to the left side of the fairway to layup short of the cross bunkers, and an iron second shot to the right side will leave a short iron to a well guarded steeply tiered green. Don't go long or left. Often playing into a head wind, the perfect drive is a slight right to left shot between the fairway bunkers to the wide area on the left side of the fairway, leaving a long iron onto an elevated green. Be aware of the steep drop off at the rear of the green and bail out area to the right side. Long Par 3 hole guarded by deep bunkers left and right. Any shot short of the green should allow a simple chip to the flag. Large contours on the green makes it important to be on the correct level. Make a par and you should be happy going to the next tee. Short Par 4 dogleg left. Deep bunkers protect the left side of the fairway. The longest drivers can hit a right to left shot over the cross bunkers to leave a short chip to the green. Everyone else will drive out to the right side of the fairway to leave a short iron to an elevated green with two large deep bunkers front and right. Watch out for the out of bounds left and water to the right. Down hill Par 3 over a lake with the green guarded by two bunkers front and centre. Green looks smaller from the tee than it really is. Take enough club to carry the bunkers and you won't be far from the flag. Plenty of room to bail out down the left side for an easy pitch down the length of the green. Long Par 4 over a ridge in the fairway to a blind green. Safe shot is a drive left to avoid the fairway bunkers, but this leaves a difficult angle from a downhill lie to the green. Longer hitters can try to drive over the fairway bunkers to leave an easier shot on the green. Water on the left will catch any errant approach shot. Great Par 4 with water all the way down the right side of the fairway. Bunkers strategically placed in the centre of the fairway leave options to drive left or right. Left is the safe line, leaving a longer approach shot. Perfect drive right will leave a wedge or short iron. Right side of the fairway is very narrow with water on the right. Small green protected by bunkers to the left and water to the right. Short Par 3 with green protected by water front and right. Small pot bunker immediately in front of the green. Plenty of room out to the left for an easy chip to the flag. Don't be short, as anything landing on the slope will go back down into the water. Drive to the right side of the fairway on this long Par 4 to leave a long iron onto an elevated green, guarded by bunkers to the left and right. Steep drop off the left side of the green will make for a difficult chip to save par. Short Par 5 with plenty of risk and reward. A birdie is in the making for two perfectly hit shots. The drive is out to the right side of the fairway avoiding the bunkers. The long hitters will be tempted to go for the green over the small lake. The safe shot is a layup to the right to leave a short iron across the water to a small tiered green. 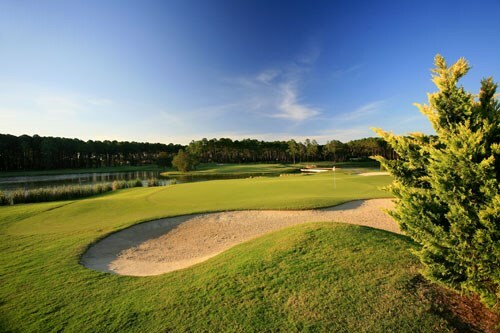 Sanctuary Cove's The Pines course is the only Arnold Palmer signature course in Australia and is rated by the Australian Golf Union as one of the nation's most challenging courses. Carved through 98 hectares of established pine forest the course features corridor approaches to several holes with lakes guarding others. An abundance of wildlife feature on The Pines including rare birdlife and scores of native Australian kangaroos. 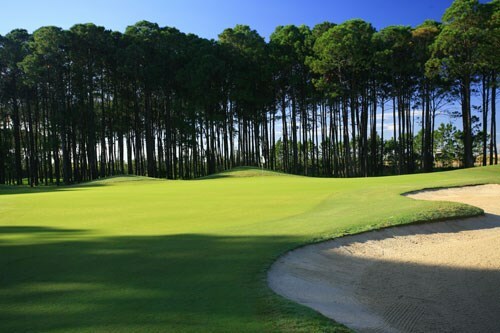 The Pines is the only Arnold Palmer signature course in Australia and is rated by the Australian Golf Union as one of the nation's most challenging courses. With an AGU rating of 76, the course has been home to two SKINS tournaments, and offers a very special golfing experience. Carved through 101 hectares of established pine forest the course features corridor approaches to several holes with lakes guarding others. Fourteen of the holes are contoured around six man-made lakes. 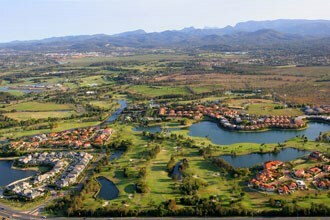 The 6681 metre course is exclusive to Sanctuary Cove Country Club members and Hyatt Regency Sanctuary Cove hotel guests. We welcome enquiries from golf club members to play The Pines. Please note: Players not with a tour operator or corporate golf day must be a member of a golf club with a Golflink number to access both The Pines and The Palms courses. 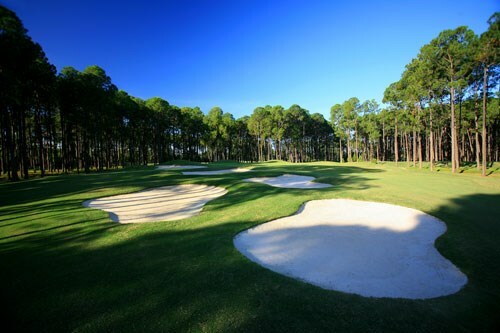 Leading golfers have played The Pines including Adam Scott, John Daly, Laura Davies, Tom Watson and Peter Senior. An abundance of wildlife feature on The Pines including rare birdlife and scores of native Australian kangaroos. A good starting par 4 but watch out for the out of bounds line in the trees on the right when teeing off. With the approach shot to the green note that the front bunker extends further towards the middle line of the fairway than is apparent from a distance. Plan to either carry this bunker or run up to the right side of the green. Even though this hole is a moderate dogleg to the left the best line is wide of the corner as the bounce is normally to the left. The green is hard to hold so use a bit less club on approach to avoid running through. A dogleg fairway to the left again calls for accuracy off the tee. The best line off the tee is down the right hand side to the left of the fairway bunker. This hole can be reached with two well struck shots but beware of the bunkers right and left and any shot that runs through the green ends in difficult country below the green. The wind at the green is normally stronger than is felt at the tee, so if it is a headwind take plenty of club. To be sure of avoiding the creek to the right many players end up down the left side of the green. The chip back up is hard to stop so swing easy. When putting from the front to the back, both the grain and the slope are against you so strike the ball solidly, and conversely watch for slippery conditions when putting from back to front. From the tee aim left of centre down the fairway. The mounds to the right kill distance and often give a very tight line for the approach shot. The approach shot needs to land on the green itself as there is no run the front right verge and bunkers protect the left side. For many golfers this means the smart play is to lay up short of the bunkers for an easy wedge on. Off the tee, water left and bunkers right. Go for accuracy not length. The tiered green is guarded by bunkers left and back and an under hit approach shot may roll back down the slope. However try to find the green and leave an uphill putt as putting from the back of the green is fast, and side hill puts have considerable break. This par 3 over water is one of the most picturesque holes on The Pines. There is a central ridge on the green and it is important to land on the same side as the flag. Check the wind and don?t under club. This difficult par 4 regularly plays into the wind. The perfect tee shot is a slight draw to give that extra roll leaving a fairway wood or a well hit long iron into the large green which is bunkered right. The impressive high pine trees effectively block out any wind within 150m of the green, so headwinds are not an issue on approach. This hole is a monster par 5 dog leg to the right. A big lake guards the right and pines line the left side of the fairway. Loosen up and relax for a well hit drive and aim the second shot to the right side if the fairway. This allows an approach shot along the longest line of the green between the front bunker and right hand bunker. This hole is reputed to be the hardest par 4 in Australia. Water guards the right all the way to the green, while any shot left will find the pine forest. The prevailing wind is left to right, and the bounce in the neck of the fairway also goes right towards water. Trust your swing and drive down the middle of the narrow undulating fairway. Subsequent shots need to stay left to avoid rolling right to water The green is one of the longest front to back so adjust your club selection accordingly depending on thecolour of the flag. This is a beautiful hole with pines all the way down the left and a creek on the right which snakes in and out of the fairway and crosses in front of the green. Aim down the left with the tee shot, so the second shot is not impeded by the trees adjacent to the creek. If your ball does happen to land in the wild country to the right of the creek, take your cart over the bridge and watch out for aggressive wildlife. The approach shot to the green is over water and into mounds which stop a ball quickly. Take plenty of club but try to leave an uphill putt. A short par 4 where there is no benefit in hitting more than 210m off the tee. There is water left and long and trees right. The fairway bunker to the left has a high lip and will cost a whole shot as it is not generally possible to hit to the green from the bunker. The green slopes upward from front to back and is easy to hold, but downhill putts can be tricky. One of the most photographed and talked about holes in Australia. From any of the tees it is all water carry to a tiered, well bunkered green. There is an option to lay up right so shorter hitters can still play the hole from the back tees. It is better to be in the bunkers at the back than in the water at the front so take plenty of club. The grain runs uphill so downhill putts are not as fast as one might expect. A dogleg right par 4. Pines trees on the right and water all down the left to catch the pulled shot. Ideally, off the tee, play for a slight fade with the driver. With the approach shot never aim to the left side of the green as balls on the left can run off and continue to run to water. The green has the steepest slope of all holes on the Pines so downhill putts and chips over the right hand bunkers are hard to hold. This par 4 can only be reached in regulation by a long drive and a straight second shot. The green is so well protected by bunkers that for many players it is best to play the second shot short of the bunkers and use a short iron to find the heart of the green. The green is long and breaks more towards the water than is apparent. Over half an acre of treacherous bunkers, some with island rough, surround this kidney shaped green like a pearl necklace. Select a club to carry all the trouble as the penalty for being a little long is not harsh, and the green slopes up so it is easy to stop the ball. The large green has few vices so long putts are very makeable. This hole is an easy par 5 after a solid tee shot. There is a wide landing area for the tee shot, and good length leads to an easy second and easy approach. However if the tee shot is short the landing area for the second shot is narrow and the safe play then is to take three short irons and reach the green in four. Very long hitters can reach the green in two, but they must watch out for water to the right off the tee and be prepared to carry a long way over water for the second. The bunker at the back of the green has many visitors so take care not to go long. One of the world?s great finishing holes. Accuracy off the tee is a must. The lake all along the left penalises a hook, but a draw is the ideal trajectory. The water to the right penalises a sliced drive as there is no stopping a ball which rolls over the path to the right. The safest second shot is down the right as the lake intrudes into the fairway just short of the green. The green is large and breaks to water more at the back than the front. 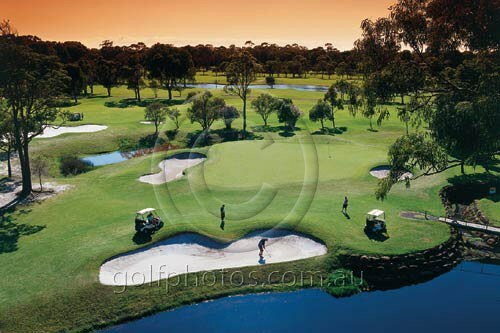 Situated along the picturesque Albert River, Windaroo offers a challenge to all levels of golfers and is sure to leave an everlasting impression. Designed by Ross Watson, who also designed Palm Meadows, Robina Woods and Paradise Palms in Cairns, the course is Par 72 with an ACR of 73. 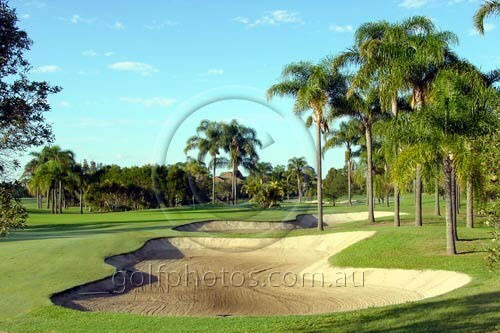 Windaroo proudly hosted the Queensland Open from 1992 -1995 and boasts arguably Australia’s hardest Par 4, the 402m double water carry 16th Hole, known as “Snake’s Gully”. The Club offers a modern Club House, Restaurant, Members Bar, fully equipped Pro Shop and Putting Green. With a reputation as one of S.E. Queensland’s Corporate specialists, and a full fleet of electric carts, your Company golf day will be offered a complete planning service. Queensland’s Gold Coast is one of Australia’s favourite holiday destinations frequently visited by its southern state neighbours. Located on the South Eastern Coast of Queensland 80 km south of Brisbane, the Gold Coast is best known for its warm sunny days and superb beaches. On the Gold Coast there are literally thousands of accommodation options from High rise apartments to hinterland retreats. 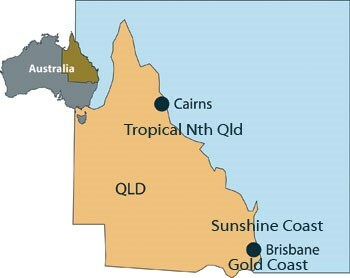 The Gold Coast precincts include Main Beach, Surfers Paradise, Broadbeach, Coolangatta, Tamborine Mountain, and Burleigh Heads. Serviced by two major airports – Brisbane Airport (a 1 hour drive from Surfers Paradise via the Pacific Highway) and the Gold Coast Airport (25 minutes from Surfers Paradise). 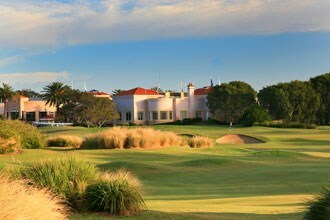 The Gold Coast is best known for its resort-style golf courses. Being a holiday hot-spot, these resorts that offer a combination of golf, accommodation and leisure activities are a popular choice for golfers all over the world. 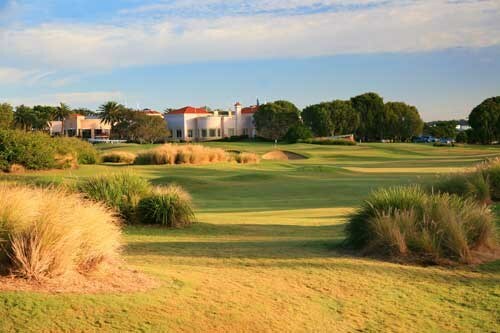 Hope Island Resort is the top ranked golf course on the Gold Coast at number 31 in Australia’s Top 100. The golf course is an 18-hole traditional "links" style championship course designed by five times British Open champion Peter Thomson and the team at Thomson, Wolveridge and Perrett in 1993. The course has been given a course rating of 74 by the AGU. The layout and design of the course is reminiscent of the great courses of Britain and Ireland in the "Links-style" tradition. Primarily the course consists of two loops of nine holes. The front and back nines are separated by an extensive practice facility, consisting of putting greens, a driving range and chipping green with bunkers. The driving range is unique in that it takes the concept of a driving lake, complete with target greens with bunkers at various distances from the practice tee. This area provides a spectacular view from the clubhouse. 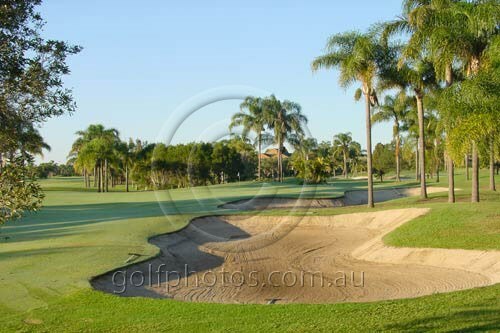 Lakelands Golf Club is located ten minutes west from the heart of Surfers Paradise, between the white sandy beaches of the Gold Coast and the Hinterland's sub-tropical rainforests. Lakelands is Australia's first Jack Nicklaus Signature golf course and is ranked in the 2004 top 50 Australian courses by the Australian Golf Digest. 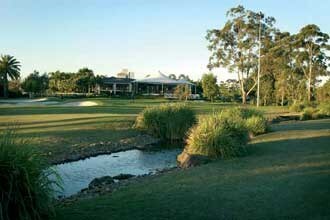 Lakelands offers many great golf experiences for golfers travelling to the Gold Coast. It took twenty five years for Jack Nicklaus to find the perfect location for his first signature golf course in Australia, and his vision became a reality in 1997 when the course was officially opened. 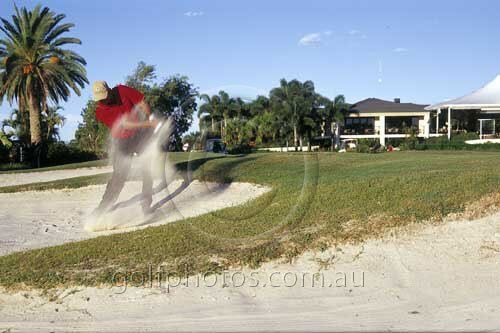 Designed by leading Australian golfer Graham Marsh in 1987, Palm Meadows Golf Course was one of the first championship courses on the Gold Coast. Palm Meadows emerged from 350 hectares of marshland, just a few kilometres west of Surfers Paradise. A par 72 measuring 6319 metres off the championship tees with water coming into play on 14 of the holes, along with 82 sand bunkers. There are eleven kilometres of cart paths bordering all fairways making Palm Meadows an all weather golf course. The first hole is regarded by many as one of the world's most challenging opening holes. With water running the entire length of the hole on the left and the world famous 'Bamboo Curtain' on the right, golfers must have their 'A Game' from the first shot of the day. 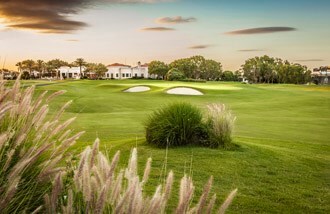 Three years after opening Palm Meadows, the design team of Graham Marsh and Ross Watson saw the opening of Robina Woods Golf Course in 1990 – adding another great creation to their resume. This course presents a truly unique golfing experience as it has been carved out of the original woodlands, making every hole a unique challenge for any accomplished golfer. The course winds its way through 65 hectares of native woodlands, with fairways lined by towering gum trees, quite is unlike any resort course on the Gold Coast. Possessing maturity well beyond its years, Robina Woods has rapidly developed a reputation as one of Queensland's best-loved resort courses. 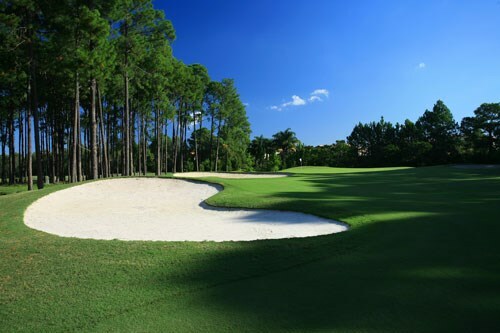 Robina Woods is a 6078 meter, 18 hole, Par 71 championship golf course. 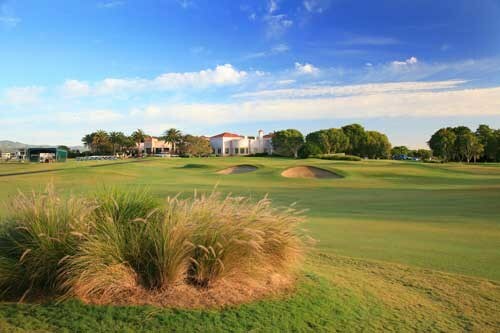 Sanctuary Cove Golf and Country Club offers two 18-hole championship golf courses – ‘The Palms’ which is currently undergoing major refurbishment, and ‘The Pines’. The Pines is available only to members or members' guests, and the only Arnold Palmer signature course in Australia and is rated by the Australian Golf Union as one of the nation's most challenging courses. Fourteen of the holes are contoured around six man-made lakes. 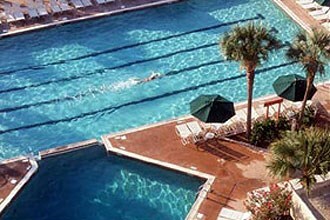 The 6681 metre course is exclusive to Sanctuary Cove Country Club members and Hyatt Regency Sanctuary Cove hotel guests. The centrepiece of Brookwater Golf Club is a spectacular Greg Norman-designed championship golf course only 30 minutes from Brisbane's CBD and 45 minutes from the Gold Coast. Meandering its way through naturally undulating Australian bushland, Brookwater bears the hallmarks of classic Norman design - signature bunkering, spectacular use of natural waterways and thoughtful integration of the existing flora. Its varied terrain, strategic design and landscaping makes it a course of outstanding character, great variety and a pleasure to play for golfers of all levels. Ranked number 26 is Australia’s Top 100 Courses, this stunning par 72 layout comprises two nine-hole loops and measures 6,505m. Its tournament standard layout is fully integrated with the residential development to create a unique living environment. Due in no small part to its ideal year round climate, 70 kilometres of famous beach and 100,000 hectares of world heritage-listed rainforest, the Gold Coast has an incredible list of activities for all ages. The Gold Coast offers the largest selection of family theme parks, golfing greens, shopping centres and restaurants, and outdoor adventure activities. From family favourites such as Dreamworld, Sea World, Wet ‘n’ Wild and WhiteWater World to Warner Bros. Movie World and the Australian Outback Spectacular. Another park not to be missed includes the beautiful Currumbin Wildlife Sanctuary which is home to Australia’s most famous and unique wildlife. Other worthwhile places to visit include the Q1 observation deck and Qdeck atop the World’s Tallest Residential Tower. Below are some useful facts and figures for the Gold Coast Region. Use these to work out the best time to visit this region.